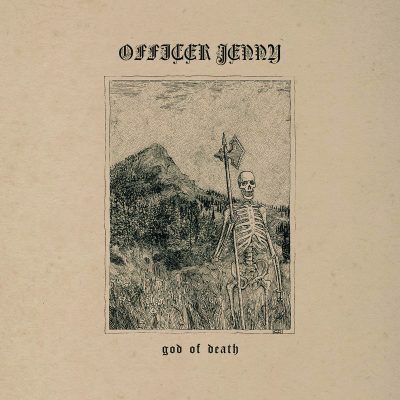 A self-reflective collection of meandering songs, the full-length god of death comes less than a year after officer jenny’s shoulder devil and takes a slower, quieter form. Stephen Cope’s well-trained voice is an able vessel for heaving out mysterious visions, fleshing them out and placing them into 11 carefully arranged songs. There is less relatable, translated confusion here than in shoulder devil, because god of death is a dream-world, ruled by Cope’s contemplative emotions. The album is riddled with references to objects, poetically named by Cope and addressed, pleaded to. “Dawn on Me, Waning Moon” addresses some of these mysterious touchstones in its synthesis of hymnic tone and grounded acoustic guitar. Cope sings for the waning moon to dawn on them, to dwell with them, but one wonders how a moon could dawn. In this dream space, though, Cope wills it to, as they will it to “Sing to me, healing stone / Bless my weathered breath / Curse the bone … restoration stone / With me dwell.” The song plays out after that with earnest guitar and starry piano, murmuring synth. Cope constructs visions of nature in songs like “There is a Sycamore by the Pond,” and yet Cope does not ground themselves in this vision. Like the album as a whole, it is a practice of balance—an embrace of the inexplicability of one’s thoughts and its fixations.